This rich, smooth, and flavourful cake is the perfect way to spoil your chocoholic, coffee loving mama this Mother’s Day. It gets even better – this cake is completely raw, vegan, and oh so ethical! Made using Fair Trade Cocoa, bananas, and coffee. 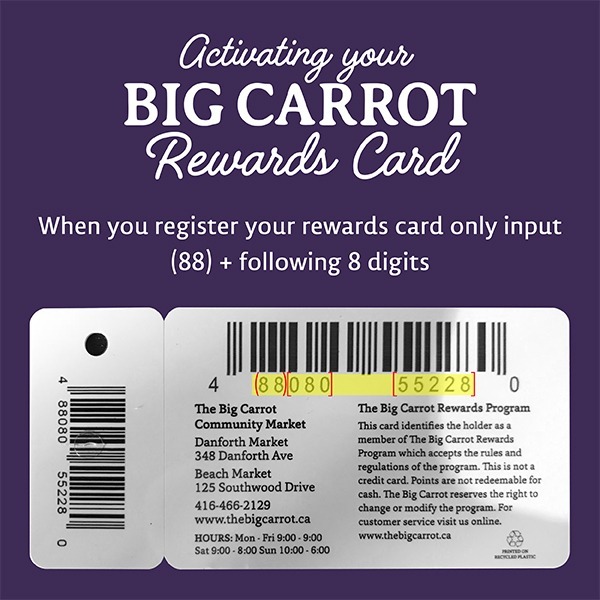 At the Big Carrot, we support certified Fair Trade items as much as possible, as they help producers in developing countries achieve better trading conditions and promote sustainability. *Note: this cake consists of three layers, two of which need to be set in the freezer for approximately 3 hours, so make this cake a day in advance. 1. Soak raw, unsalted cashews in a bowl filled with filtered water at room temperature for a minimum of 3 hours. 2. Line the base of your spring form pan with parchment paper and fold under. Using coconut oil, grease the sides of the pan to avoid sticking. Place in freezer for the time being. 3. Place almond meal and pitted dates in food processor. Add melted coconut oil and salt. Process until consistency is slightly wet and crumbly. 5. Drain soaked cashews; they should be plump and soft. 6. Using your Vitamix or high-speed blender, blitz the cashews and one of the bananas into a paste. Add the rest of the bananas, vanilla extract, coconut oil, and coffee. Blend until smooth. 7. Pour the café vanilla mixture into your pan and spread evenly. Cover with plastic wrap using an elastic band, and place the cake in the freezer for at least 3 hours to set the layer. 8. While the second layer is setting, blitz one banana, maple syrup, vanilla extract, and melted cocoa butter in your Vitamix or high-powered blender. Add in remaining bananas, diced avocado, salt, cocoa powder and brewed coffee. Blend until smooth. 9. Pour the mocha mixture into your tin and spread evenly. Cover with plastic wrap using an elastic band, and place cake in the freezer for at least 3 hours to set the layer. 10. Fill a large kitchen sink with 1-2 inches of hot water. Remove cake from fridge and place in hot water for 30 seconds without allowing water to seep in. This will loosen up the cake, making it easier to get out. Remove cake from water and place on a kitchen towel. If your sink is too small, use a hot cloth and rub along outer side of pan. 11. Slowly remove the side of the spring form pan. Carefully lift cake and unfold parchment paper and gently slide cake on top of serving plate. Garnish with raw cacao nibs, coffee beans, crushed salted cashews, or edible flowers. 12. 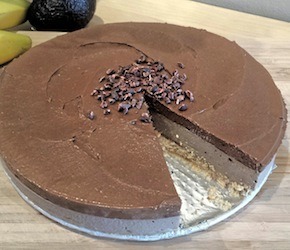 Using a heated knife, slice a good size portion of this tasty raw, vegan, Fair Trade cake and ENJOY! Store cake at room temperature and consume within 2 days. Cake can be kept frozen for 5-7 days, as long as no moisture gets in.